Interesting research from Disney Research at Carnegie Mellon University in Pittsburgh. It’s a speaker that can be made by a 3D printer that can be created any shape. This is basically an electrostatic speaker using a thin conductive material and an electrode plate separated by a layer of air, but made via a 3D printer. We propose technology for designing and manufacturing interactive 3D printed speakers. With the proposed technology, sound reproduction can easily be integrated into various objects at the design stage and little assembly is required. SoundWorks Collection has just released a new video (on top) with a tour of the post production facilities on Walt Disney Studios. Take an exclusive tour of the Walt Disney Studios located in Burbank, CA hosted by Gil Gagnon, VP of Post Production Services. The Walt Disney Studios Post Production Services has a rich history in Dubbing dating back to the early 1940′s when Fantasia was mixed in the Main Theatre. Fantasia went on to win several technical achievement awards from the Academy as it was one of the first to mix in “Stereo” and it actually incorporated an early form of surround sound termed “Fantasound”. 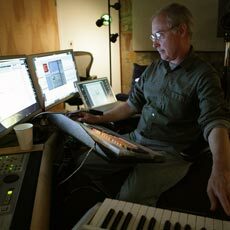 The Sound Editorial department is staffed by a talented crew including two-time Oscar-winner George Watter II along with Robert Sephton, and Thomas de Gorter. The facilities include Pro Tools Digital Audio Workstations and 5.1 sound design rooms that are truly state-of-the-art. In addition, this world class facility provides complete sound integration and compatibility with the mixing stages in a conveniently located campus-like environment in Burbank, CA. Ben Burtt, he’s the sound designer who worked on huge films such as Star Wars, E.T. The Extra-Terrestrial, and Indiana Jones to name a few. If a robot falls on a deserted planet, does it still make noise? According to sound designer extraordinaire Ben Burtt, the talent behind the stars of Disney·Pixar’s “WALL·E,” it most certainly does. And you’d be surprised at how many years of research and development it takes to make every squeak, creak, click, and clank seem so real.